Black shoe features a no-print lining. We’ve used these for several years, and I love them! As my oldest is getting older, her feet are starting to get a little too hot in these, so we’ll be switching to canvas once she outgrows them. But for little feet, these last a long time, they’re very well made. This was the second time I ordered these shoes. I liked them so much the first time that I ordered again when it was time to size up. Each pair held up great through the duration of her dance season. They were still in good enough shape that they were passed down to the next little bellerinas. Purchased for my 2yo daughter. This is an adorable shoe. It appears to be comfortable and well made. Unfortunately it appears to run 1 size small. Just ordered the next size up. I've been buying this slipper for my daughters since they started dance 4 years ago at the age of 3! The girls are now dancing 3-4 days a week and these last them the whole season, and still have life in them when it's time for us to move up a size. Great shoes! My daughter adores the pattern and seems to like them! I consistently buy this same shoe for my daughter. It's a high-quality shoe and is cheaper on this website than any other place I've found. The sizing is always a wee bit challenging because this shoe does run small. I always got at least one full size bigger than what she currently is. It's nice you're able to tighten the sides of the shoes since they are usually a little big during the beginning of ballet season. Great shoe! I'll be back next year to buy another pair. These are perfect and very durable. The flowers inside are really cute too. I am glad we decided to go with these. Nice shoes, just run small. Shoes are very nice, but they run very small. I didn't read the reviews though... will have to send these back and order a bigger size. Cheaper than buying from store, and shoes fits well and still has a little room for growth this year. But wish the shipping could be faster. These shoes fit great for my 3 1/2 year-old beginner ballerina. She wears an 8 in street shoes, so I ordered her a 9 in these slippers. She probably has 1/8 inch of room to grow, so they're snug, but not uncomfortable. They are great quality with a great price. Ordered street shoe size as suggested, and it fits well with a little room at the toe. I always order a narrow in childrens because they tend to run wider. Good, sturdy, basic shoe with a good price. Have purchased Daisy for years now. I bought 3 pairs for my 4 year grand daughter to try, she is in a program with her circus class. I paid half what they are charging at the class for the same slippers. I checked htem out & they look very nice well made & the leather is very good. Thought I might buy a pair for me to use as slippers. She has not tried them on yet so will see how she likes them. but so far so good! I would have given them 5 stars but she has not tried them on yet. This is perfect for my 4 years old daughter. The fitting was just right since I ordered her street shoes size. My daughter loved it, she wants to wear them all the times! Shipping was fast too. These shoes are definitely true to it size! My 4 years old ballerina absolutely adores these shoes!!! As most do, these slippers are running about 1/2 size smaller. If I would have ordered a whole size larger as suggested they would have been to big. Half size bigger than street shoes worked out great. Just received them, them a very confortable. They look durable, but won't know until after the dance season about durability. These are the recommended slippers for her class and they are what she says is comfortable, and she loves them.... I have to fight with her to keep her from wearing them all the time. So she will practice everyday just to wear them around the house. She wore them for a year before out growing them. Minus the cherry juice stain on one of the toes they look as good as they did coming out of the little box. I purchased these for my toddler. He loves them - they seem comfortable and well made. I can't speak to how long they last for older kids (who are harder on their shoes), but for a two-year-old they're perfect. He'll outgrow them before he wears them out. I ordered one size up from his street size and they fit like a glove. My son started dance and we couldn't find black ballet shoes anywhere in our small southern town. These shoes are perfect, and the price so much more reasonable than brick and mortar prices in the nearest city to us. This is his second pair, as he is growing too fast! I owned more than one pair of these shoes when I was younger. They were the most memorable of all the shoes I had as a beginning student, mostly due to their cheerful lining. I believe that I had my first pair at about age six or seven, and I used them in technique classes until about age eleven. The tag on the inside is SO INCREDIBLY HELPFUL! (especially when I was in a class with fifteen other little girls who all liked the pretty flowers!) A wonderful shoe which I would recommend to ALL young students. Discount Dance shipped and delivered less than 48 hours of receiving the order. 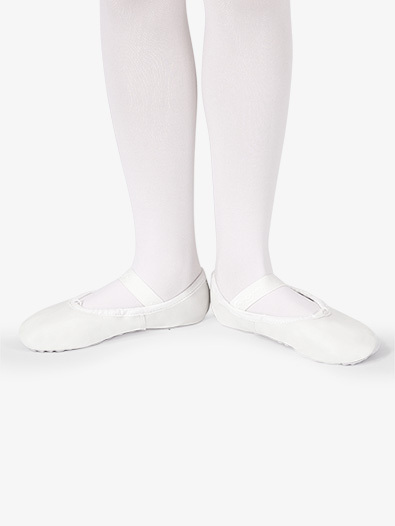 However, these are horrible to have the Capezio name. I purchased a 2.5 narrow which had a lot of space on the sides and did not look like as pictured.You get what you pay for. My daughter loves these. When she does dance recitals, afterwards, she wants to wear them out. 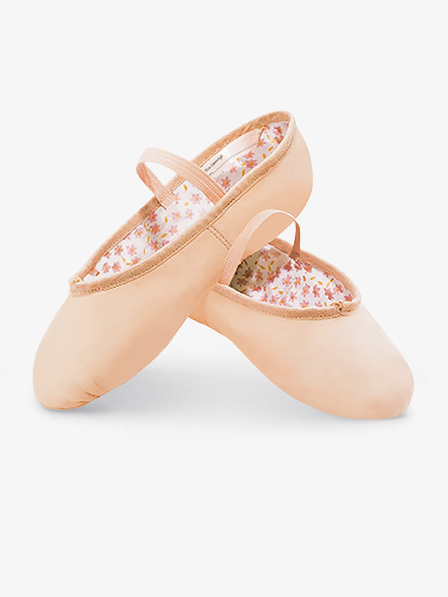 My older daughter used to wear these but since she is on pointe she wears Gaynor Minden which she absolute LOVES! These shoes are absolutely perfect for your beginning toddler. 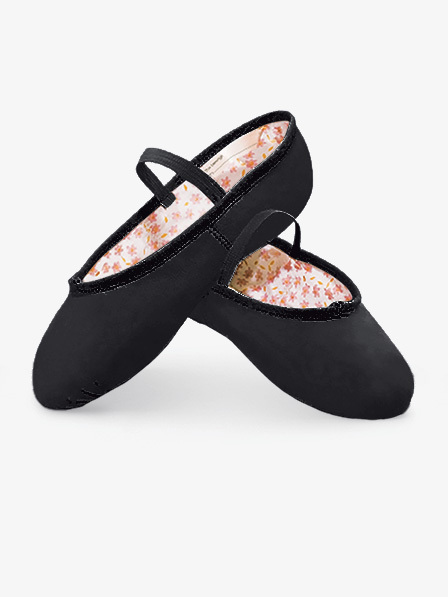 These were my very first ballet shoes and they were great. Although they are more for children with a wider foot, they fit all children. Warning: the sizing chart is off by a size or two but what chart isn't. 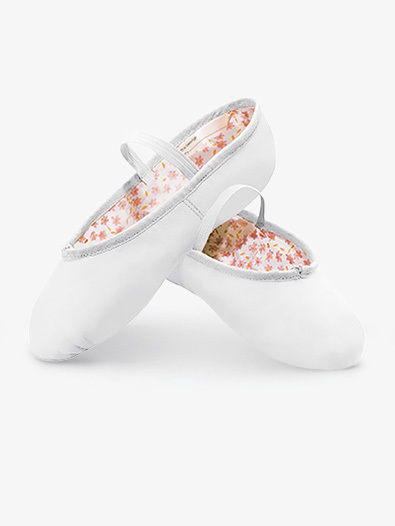 I highly recommend this shoe to dancers ages 3-6. After that, a split sole shoe is recommended. A great shoe, but not for all kids! In my opinion, this is a decent shoe for beginning children - I know little things like the daisy lining appeals to them. However, I am not so sure young toddlers may like them. I bought these for my 2-year- old daughter when I started her in ballet and she did not like them. I also think they did not fit well. I think some picky toddlers might not like them. I tried Capezio's Bunny Hop slippers for her, and she loves them. She seems very comfortable in them and the little things about them appeal to her. She looks forward to putting them on for class. In my opinion, they are more suitable for toddlers and young children. I still think this is a decent beginning shoe and when my daughter is older, I will see if I can switch her to these or to a shoe like Bloch's Dansoft. But for other children, perhaps older, I think this would be a good, economical beginning slipper! Don't read the size chart! 1st: I am very disheartened with Capezio on this one. I bought a pair last year for one daughter (street 3 1/2N, slipper 4 1/2M). I expected it would fit a little baggy, and it did, but not terribly. I just ordered another daughter a 3 1/2M and it was huge! It is exactly the same size as the 4 1/2- same length, width, depth. Now I have to pay to send them back. Thanks Capezio! 2nd: The children's shoe page says to order 1 size larger than street. This is correct. If you click "Looking for larger child sizes?" you will view a chart for street sizes 1-4.5 that says to add 2 sizes. Do not follow this chart. You will get a huge shoe! My son has gone through 2 pairs of these already. Not because of wear and tear, but he's just grown out of them. They fit him very well and we've never had any problems. It is such a great little shoe!! I purchased these slippers for my daughter and we just absolutely love them!! The one and only problem I have with them is keeping the elastic drawstrings tied. You have to pull them really tight and knot them several times. These are wonderful! I am buying two more pairs today for my little girls who are 3 and 5. The quality is great for the price. These slippers are very soft and perfect for beginners. I highly recommend them! My granddaughter loved the shoes and Grammy, the quality!...a big Birthday hit!!! for a 4 year old. The N, M, and W refer to the width of the shoe. N = narrow, M = medium, and W = wide. My girls measure (stride rite) at 8.5 toddler girls and 9.0 toddler girls. They do not have wide feet and are pretty petite for their age. Should I just order this size? I am afraid if I order a bigger size they will not fit properly. Please advise. thank you.